These are not for those who do not like turmeric. The recipe I found called for a full tablespoon of ground turmeric, and as much as I love that stuff even I don’t love it THAT much. Which is why I only used a teaspoon. They are still packing that earthy flavor but it’s not as strong. My reason for making them is because I have been in a lot of pain since last week and it’s to the point where I am struggling to get out of bed. These are crazy easy to make and can be put into any mold you desire. I used ice cub trays that have the easy release silicone bottom and chopped them up so I can add them to my lemon honey water and breakfast/lunch broth which it is amazing in! 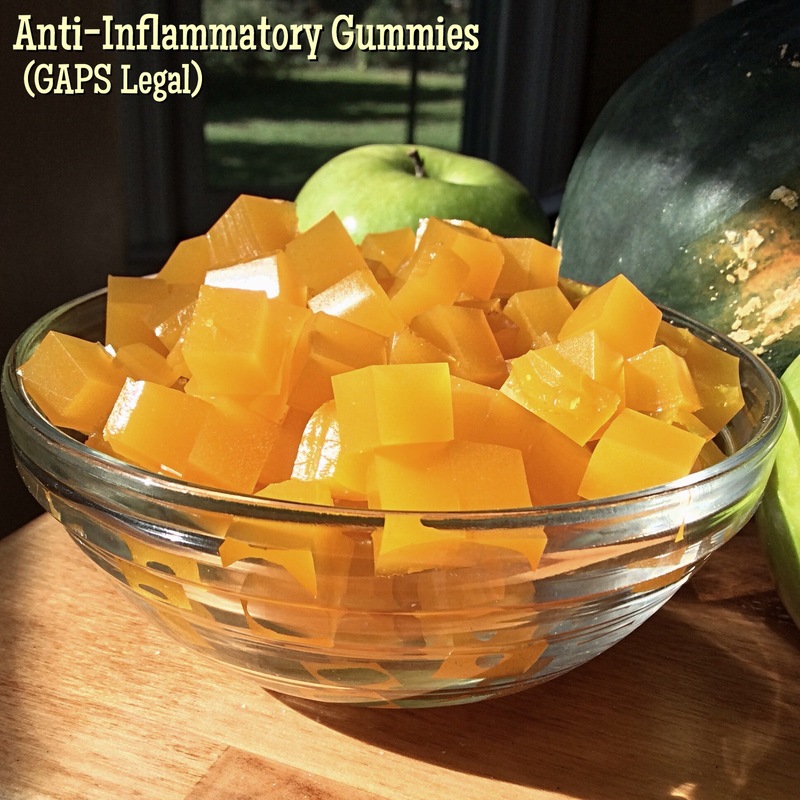 In a medium mix bowl add turmeric, ginger, lemon juice, honey, and gelatin. Stir to combine. Set aside and bring water to boil. Add water to remaining ingredients and whisk for two minutes, or until gelatin is completely dissolved. 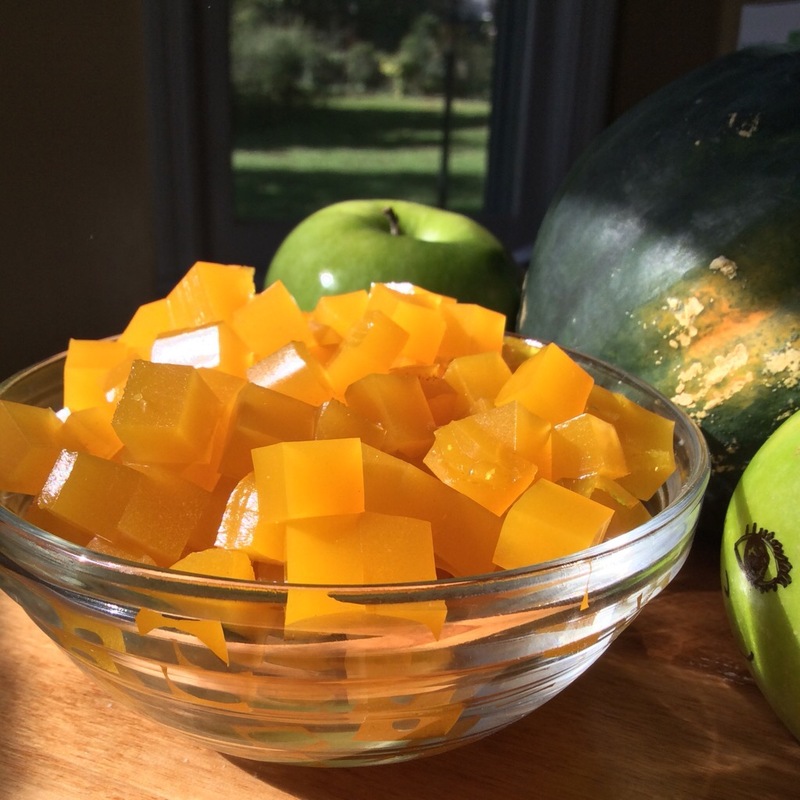 Pour into ice cube tray, 8×8 inch square pan, or silicone candy molds. Refrigerate for an hour or overnight. Use within 7 days. I used ice cube trays and made 17 cubes. I then chopped up the cubes and use 12 mini cubes per 11oz of hot lemon honey water and 1/4 c of mini cubes per 2 c of chicken stock. Delish! For storage I just keep them in a ziplock bag, labeled, and in the fridge. You can store these in a glass container if you prefer, a Ball glass jar and lid would work as well. Play with flavors. 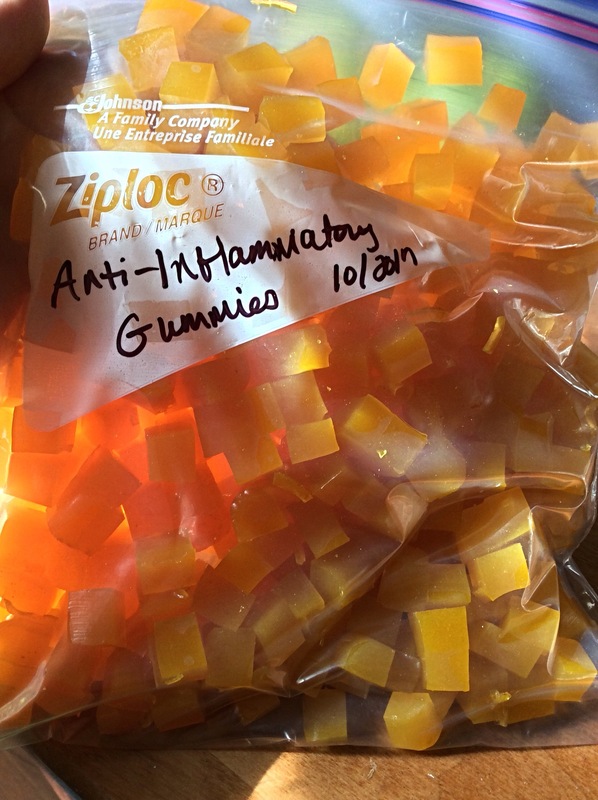 Below I made pomegranate flavored gummies for my son. 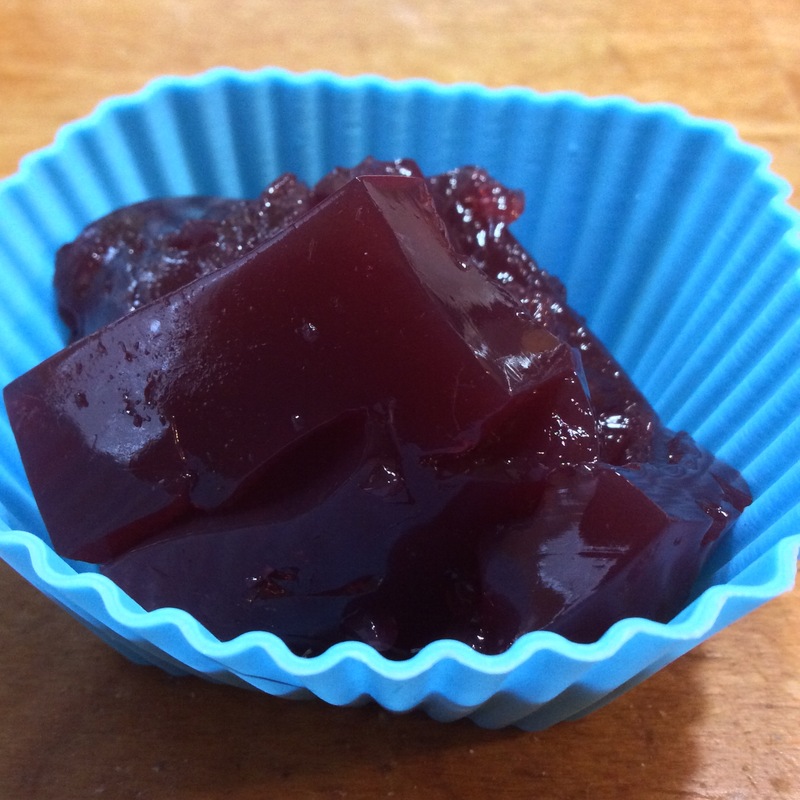 A slightly different recipe but one that G has deemed better than boxed jello. 😲 I’ll share that recipe later! Hope these bring you comfort and relief as they have me. If you’d like more information about the healing properties of turmeric comment below and I’ll be more than happy to share in another post. As a curious person, I always like to get as much information as possible, and that’s what drove me to see what Prime Pantry was all about. I got the feeling that the service is relatively new as there are lots of products not listed as yet, and the NEW category was chock full of items. There’s even a place to suggest items you’re looking for. 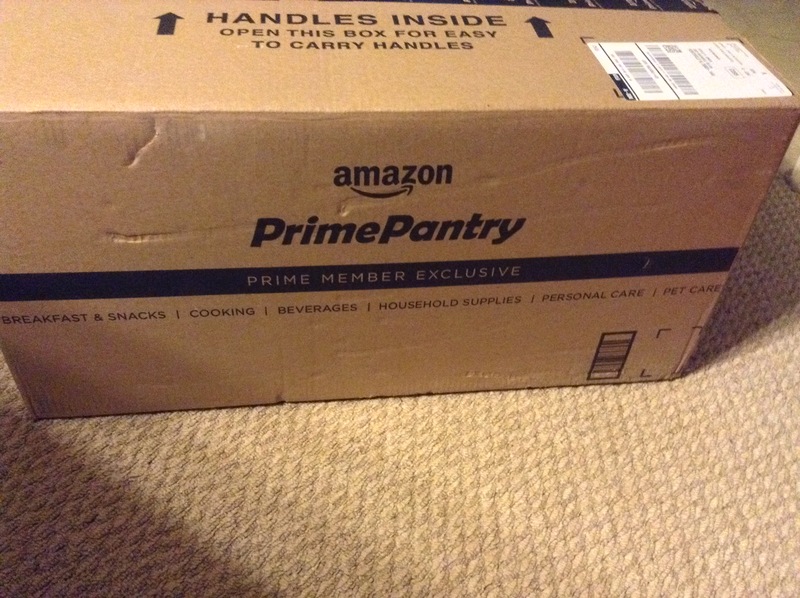 Any product that’s available for inclusion says “Prime Pantry” next to it. Everything is divided into categories, so I didn’t need to sift through endless pages of products to find what we usually shop for. Of course, you can also use the internal search engine for specific items. There’s also a section of items that have coupons that are applied at the time the item is placed in the box. 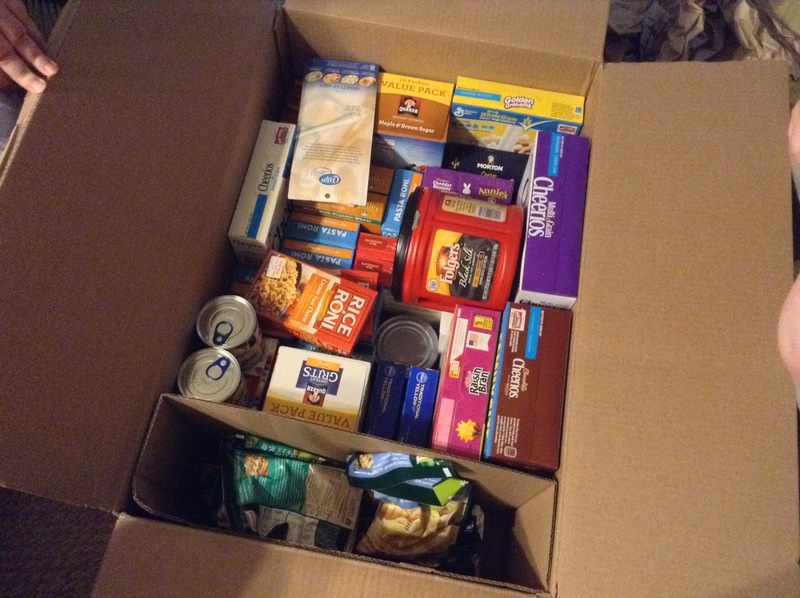 Best of all, you can shop by either the percentage the box is full or by pounds (45 lb. max). And it ships for only $5.99! It was just a matter of adding items to my “box.” Each time I added an item(s), the pop-up box told me by what percent my box was full. When I got it to 98.4% full, I simply added an additional item from my box to tell me I had reached max capacity. There’s also a sidebar that has suggestions for topping off the box with items that won’t start a new box (which it will do if you go over 100%). The whole process was fun and easy–even Checkout. Arrival was estimated at 5-7 days, the earliest date being Tuesday, the 9th. Imagine our surprise when it arrived on Monday, the 8th! It felt like Christmas! The box itself is very substantial, double layered for extra sturdiness, and yeah a few dings in the box but that’s typical. All the items inside were not damaged in any way. 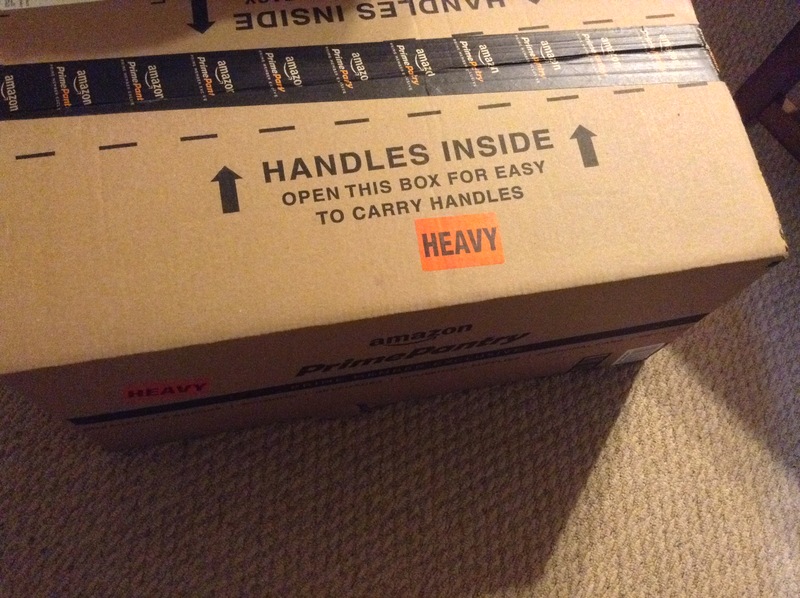 I swear Amazon must have expert Tetris players working in their packing department. I can’t explain it, so I’ll just show you! 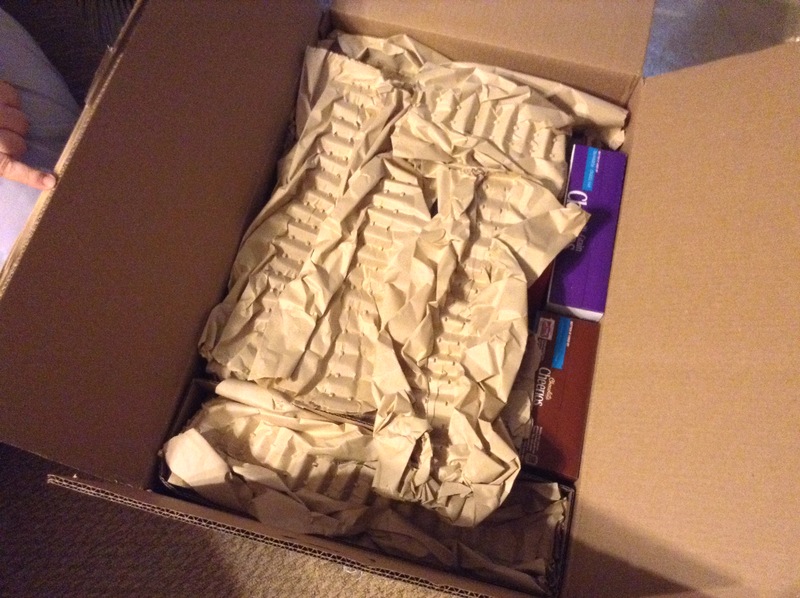 Excellent packing material on top! TA-DA!!!! 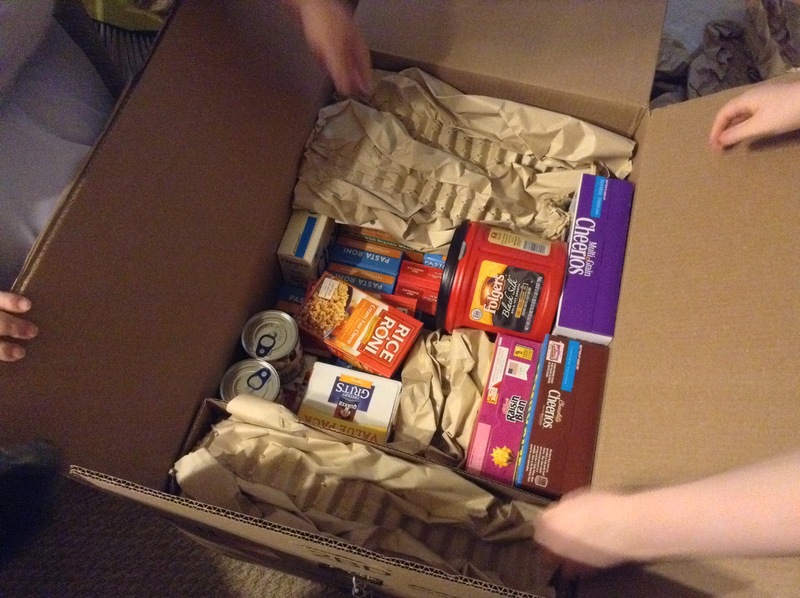 And there it is, it’s amazing just how much stuff was in that box and the uber cool thing was that they divided the soft packaged items from the canned and boxed items. Very nicely done. We will most likely be doing this again, perhaps once a month. I think the only downside, which really isn’t a downside but rather a preference, is that it says Prime Pantry on the box. If it just said Amazon that would be enough. Even better, if it didn’t say anything at all. But that is a personal preference, I’m just glad we always have someone here at home who can bring in such packages right as they arrive. I would hate to leave such things outside all day. The fear of someone taking it or leaving it exposed to the elements bothers me. Especially since we had a bad thunderstorm pass through yesterday dumping all kinds of rain. That box would have been soaked through. Hope this helps someone out there decide to give this a try and build up your food storage. I know many of you have seen the posts about salad in a jar, some of us have thought what a neat idea and others have cocked their head to the side going “huh?” But that’s ok because today it’s all going to make sense! It’s not very often that my Dad will make a request for me to make him something for lunch. He had a certification class he had to take at work and wasn’t sure about his lunch time allotment, so he asked me to make him a salad in a jar. I. Lit. Up! Shocked that he knew about such a thing, he must had seen one of my posts on Facebook about it 😉 It worked out that Tuesday night I had made some chicken for dinner and could incorporate that into his salad! How much of each ingredient do you add? Well, I didn’t measure (of course) and just went with it. Since I had about 4–5 small pieces of chicken leftover I just cubed those up. The mini sweet peppers I used were 1 sweet red, 1 sweet yellow, and 2 sweet orange(since they were really small). 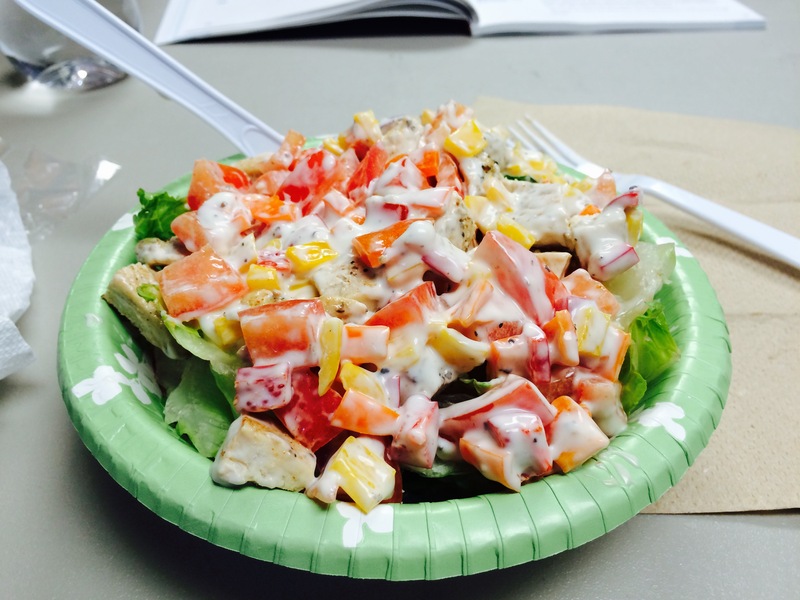 As for the lettuce, I packed in two big handfuls of romaine mixed lettuce. I pushed it all down into the jar and for a second I thought this might be too much but as you’ll see in a picture below that it was actually the perfect amount! 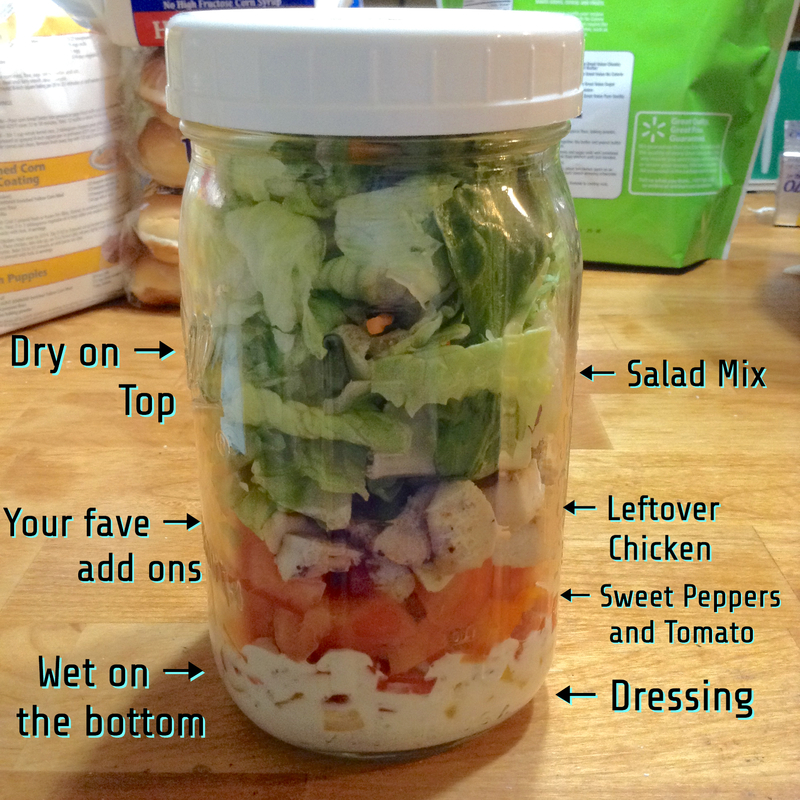 Ok, enough hype…let me break it down, or rather show you a diagram, of how to assemble a salad in a jar. Mind you, your choice of ingredients are limitless, the picture is JUST to show you the ‘how’. How do you eat such yumminess? EASY! 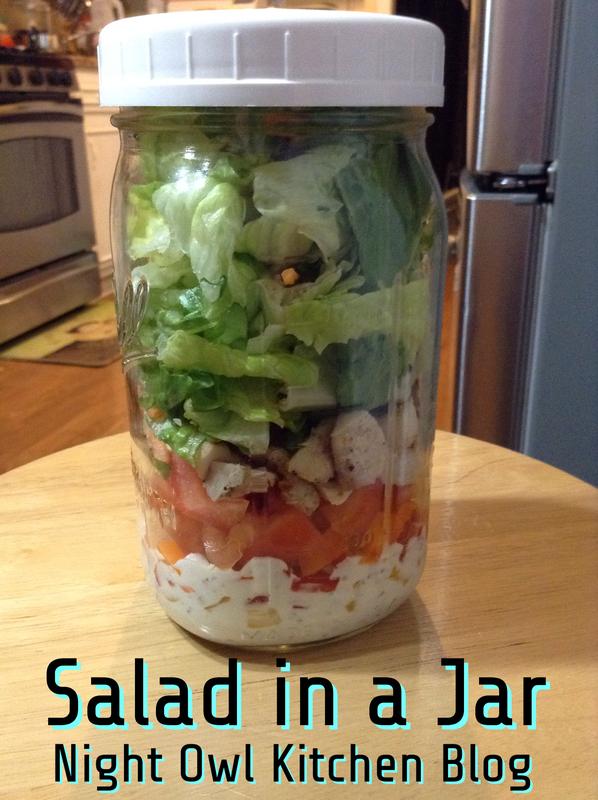 Be sure to check out All Parenting‘s website for more ideas and recipes for salads in a jar! I hope everyone is staying warm on this Tuesday. Goodness, I cannot get over just how cold it’s gotten here in the south. I’m definitely not complaining, I actually love it! Anything that will delay the onslaught of mosquitoes is fine by me 🙂 I know many of my friends, however, are longing for spring and warmer temps. They’re tired of having cold noses, stinging cheeks, and their teeth chattering all the time. But hopefully today’s recipe will warm you back up in no time! Prep 9×13 baking pan with a little nonstick spray or butter. You could also use Reynolds Release Foil to line the pan. Pop each can of crescent dough and use about 1 1/2 cans for the bottom and sides. Pressing it together to close up the seams and evening out any thin spots. Set aside. In a medium pan over medium heat melt butter and add onions and carrots. Season with salt and pepper, letting them cook till tender. Add in dried minced garlic, diced chicken and cook until garlic is softened, chicken is heated through. Pour in drained peas, stirring carefully so as not to mash the peas. Combine soup and milk and add in to the pan. Fold in shredded cheese carefully. Mixture will be hot, slowly pour into prepared pan smoothing it out evenly. Lay the remaining dough(1 1/2 cans) and press the edges together to seal. No need to worry about the seams, they will act as vents. Bake for 20-22 minutes or until golden brown on top. Let cool for 10 minutes before serving. The chicken I used for this recipe was Tyson’s Grilled Chicken Strips. I guesstimated that I had about a pound of chicken. You can certainly add more if you like or use another brand that you prefer. You can boil chicken for this and chop it up, or use leftover rotisserie chicken if you have it. That would certainly add another layer of yummy flavor!! Turkey may be substituted for chicken. The brand of peas used in the recipe are an old family favorite. They are smaller and a tad sweeter, but you may you use any brand you prefer. Just be sure to drain them well. I used two cans of the same soup, you can use a cream of chicken and mushroom with a can of cream of broccoli. If you have one can of cream of mushroom soup and nothing else, add it to a package of country gravy mix(with 2 cups of milk) and pour into the pot. 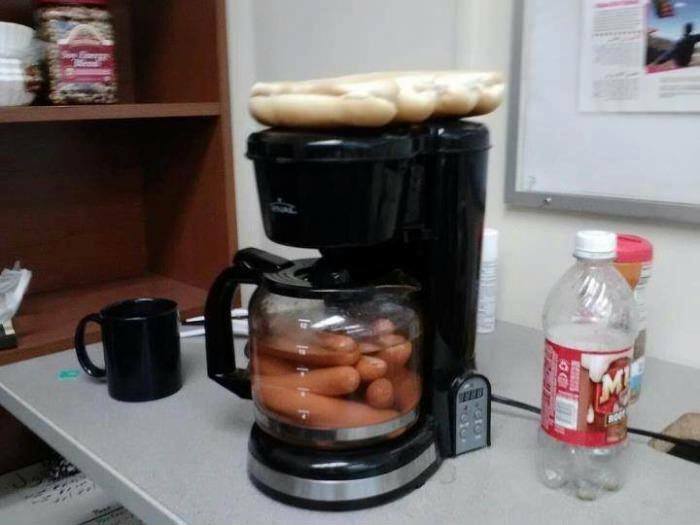 This would eliminate the need for the 1 1/2 cups of milk in the original recipe. Potatoes may be added as well, just be sure to cook them till they are tender and be careful when adding them into the mix. You’ll want to keep them roughly the same size as the rest of the vegetables. Somewhere close to diced or a tad bigger. And there you have it! 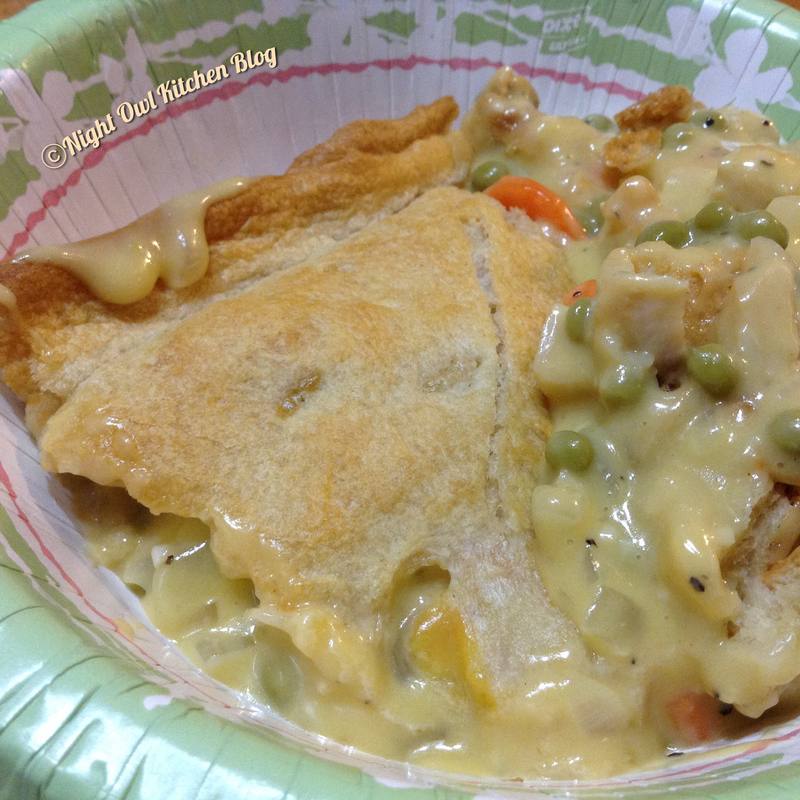 A semi-homemade chicken pot pie and this can be served with salad on the side. Or served alone, which is how we ate it. It’s a filling dish and quite tasty(but I know with a homemade dough it’s going to be even better)! Stay warm and have a blessed Tuesday!! Afternoon everyone, hope you’re all doing well. My thoughts and prayers go out to those up in the New England area. Praying you all have enough supplies and stay warm. Here in my neck of the woods we’ve been inundated with illness. A lot of my friends and their families have been sick with stomach bugs, the flu and the cold. We, ourselves, have the cold going around in our house at this time. Dad purchased a bag of clementines(Halos) and instead of letting them go to waste, I decided to make a vitamin C boost drink to help our immune systems. Yes, it may sound strange but Clementines(aka Halos, Cuties, pick a name) are 60% Vitamin C. That’s pretty good for a little fruit, and coupled with lemons which are 51% Vitamin C you have a super boosting mix that is sure to shock what remaining cold virus is left in your system! I have run into some conflicting information concerning concentrated lemon juice. While fresh lemons contain 51% Vitamin C, it is said that ReaLemon Juice from Concentrate(which is a brand we prefer) contains 60.5% Vitamin C. I’m not going to get into a debate about fresh or concentrated juices, but I found it odd that one would have more than the other. Could be that ReaLemon Juice is more concentrated than fresh and therefore would contain more Vitamin C. Purists however may opt for freshly squeezed lemons in the end. Whichever you prefer to use I leave that up to you, I won’t judge you one way other another. 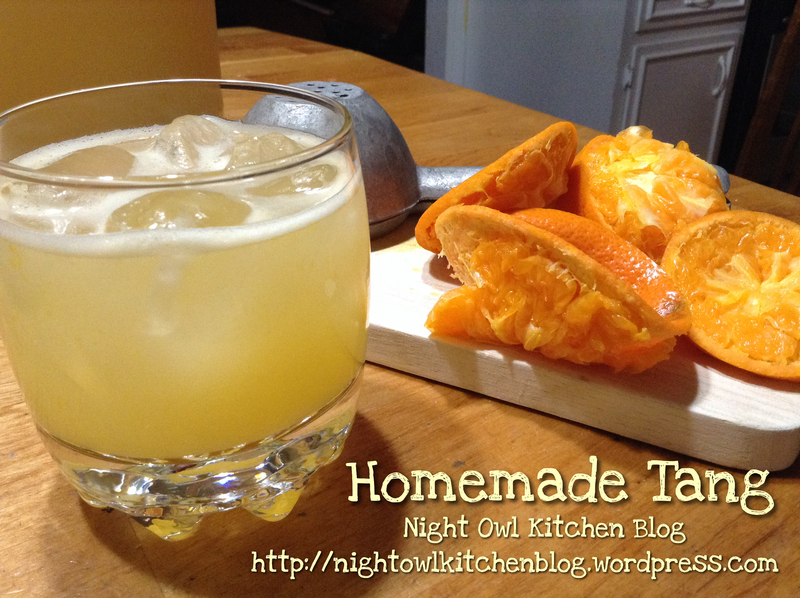 In a 2 quart pitcher, add lemon juice, clementine juice, and Stevia. Whisk to combine and add water. Continue whisking until all the Stevia is completely mixed in and enjoy over ice. 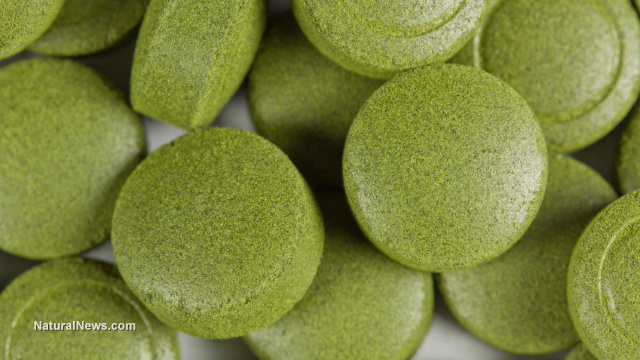 **Stevia in the Raw– Why not sugar or some other sweetener? It’s a personal preference in my book, feel free to use sugar or other sweeteners that you may prefer. I’ve read the pros and cons about Stevia in the Raw, I’ve also used Pure Stevia powder in the past. To me, the powder was more bitter and difficult to use. However, using Stevia in the Raw takes all the guess work out of how much to use since it measures cup for cup like sugar. Stevia in and of itself is a very alkaline all natural sweetener that is actually good for our bodies. Unlike aspartame, which is synthetic and causes many health issues, Stevia comes from a plant. Again, I leave the sweetener up to you. I just find that using alkaline foods when sick actually help to knock out the virus or bacteria more quickly. Viruses and bacteria need an acidic environment to thrive in, neutralizing the body will make it less habitable for the cold and flu survive. This recipe can be altered to make a Lemon–Limeade. Instead of Clementines, squeeze 5–7 limes and add the remaining ingredients as listed. For an all out citrus blast, squeeze fresh lemons, fresh limes, and clementines for a NOK Citrus Beverage. Freeze concentrated lemon, lime, and orange juices into ice cubes(adding a little water or another fruit juice to aid in freezing), add fresh slices of each fruit into the pitcher, and serve over ice. Pomegranate ice cubes would look amazing in this drink, just add the juice to an ice tray and freeze. It’s a yummy treat on a hot summer day! Hope everyone is staying warm! Woke up today to sleet, a nice sight considering we haven’t had much of anything this winter other than rain. I would have preferred actual sticking snow, but sleet was just as nice to see 🙂 It’s on days like this I just want to hunker down under a warm blanket, cup of coffee nearby, a little heater aimed at my feet, and get lost in a book. It’s a day to not do anything! 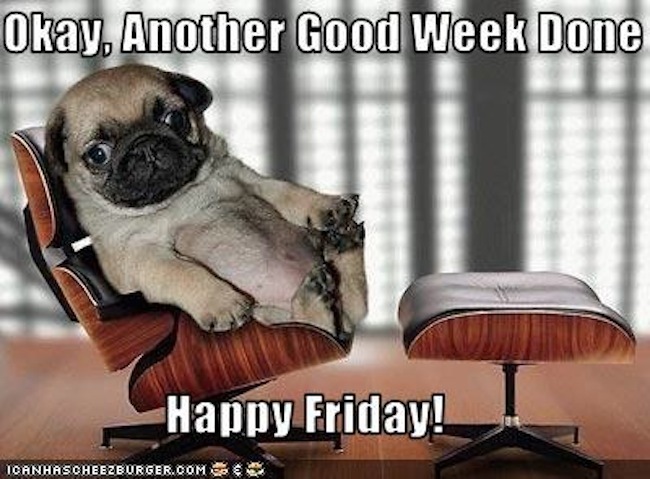 However, it’s also a day fire up the oven and warm up the house with some baked goodies! Each year G–Man and I set out to decorate holiday cookies and last month I think we REALLY discovered something yummy! I didn’t grow up decorating holiday cookies, Mom and I did that once and never again because of how messy it was. True, it can be very messy and now you all know where I get it 😉 It’s hard for me let my son in the kitchen to help with cooking and baking because the mess seems to grow. But determined to create our own holiday memories, I put aside my angst against messes and let G–Man have at it. Rolling out the dough, cutting out the shapes, sprinkling on the colored sugar. My hand in it is the making of said dough, putting in and pulling out the pans from the oven, and applying the frosting. We always have a lot of fun and actually enjoy ourselves! There is hope for me yet! Last year I discovered a very tasty cut out sugar recipe. I wanted something that was going to soft, chewy, and yet sturdy enough to hold up to the frosting. And then I wanted a frosting that wasn’t overly sweet, that would have a delicious vanilla flavor and set up in no time. Boy did I get lucky with the recipes and I am so happy to be able to share them with you today! 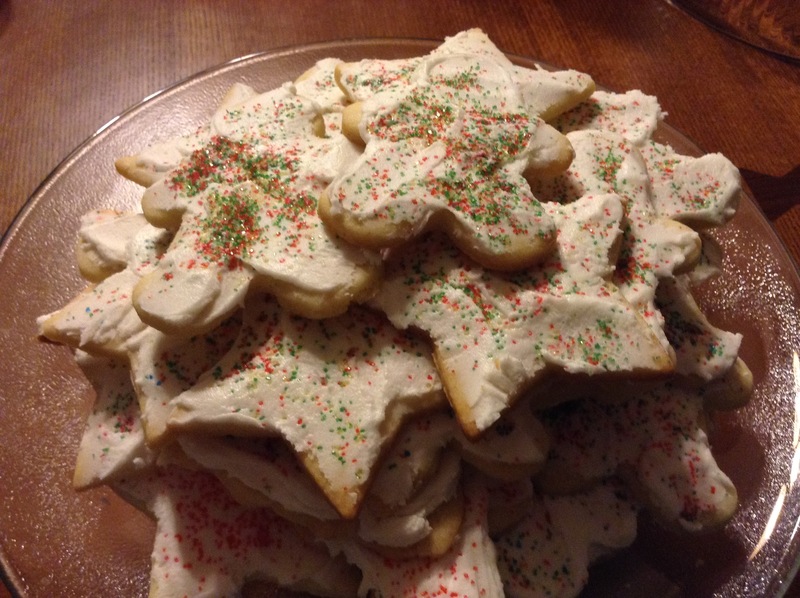 The recipe for the cut out cookies is over at Sally’s Baking Addiction. The only thing I didn’t have for the recipe was almond extract, no bigs I just replaced it with more of our homemade vanilla extract which was a great idea! We decided to keep them simple this year, stars, gingerbread men, and Christmas trees. The year before last we used a store bought icing tubes(red, white, green) and while that did make our first time decorating cookies I wasn’t too impressed with the outcome. So this year I made the commitment to making the frosting from scratch. But first let me brag about Sally’s cookie recipe. Chewy. Soft. Flavorful. Not too sweet. Everything I ever want in a cookie and more! It was an easy enough recipe to make and here’s a trick when cutting them out. Instead of rolling out on a surface and then transferring them to a cookie sheet, I turned a baking sheet pan upside down, applied a scant amount of Crisco to the pan and laid a piece of parchment paper to it. The Crisco helps to keep the parchment paper in place when rolling out the dough. I only rolled out the dough twice before discarding. reposition the cut out pieces on the pan and bake according to directions. They came out perfect! Once cooled G–Man would move them from the pan to a cooling wrack and we would continue on to the next batch. So fun! And now for the frosting, I based mine off of the one I found over at allrecipes. But like always, I chose to change it up slightly. See, I don’t like adding milk and vanilla extract to my frosting recipes. It’s too much liquid and the vanilla flavor is never right. I know I’ve shared this many times before, but I like to use flavored coffee creamer in lieu of milk and vanilla extract. That shouldn’t shock anyone but I’m sorry if it does. I am especially fond of the French Vanilla coffee creamer(yes, the liquid stuff). So, here’s the link to the original recipe, but below is how I changed it. Try both and decide which one you like best! In a large bowl, cream together the confectioners’ sugar and shortening until smooth. Gradually mix in the coffee creamer with an electric mixer until smooth and stiff, about 5 minutes. Color with food coloring if desired. And that’s it! My youngest nephew was impressed and because he liked them so much I sent the rest home with him 🙂 Of course you don’t have to use French Vanilla coffee creamer, you can use Hazelnut, Irish Cream, Amaretto, Caramel…really the possibilities are endless! Especially around the holidays when there’s white chocolate, peppermint, and eggnog. 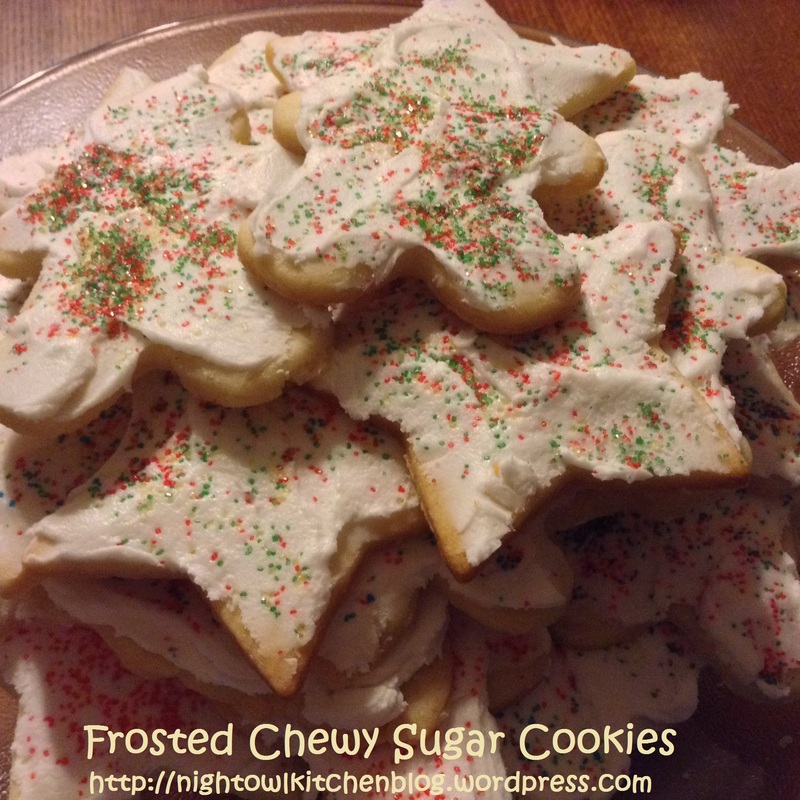 And that’s how this Night Owl does Frosted Chewy Sugar Cookies. I had G–Man keep the decoration simple, just red and green colored sugar. Explaining to him that I wanted the flavor and texture to be “center stage” rather than piling on numerous candies, sprinkles, and layers of frosting. 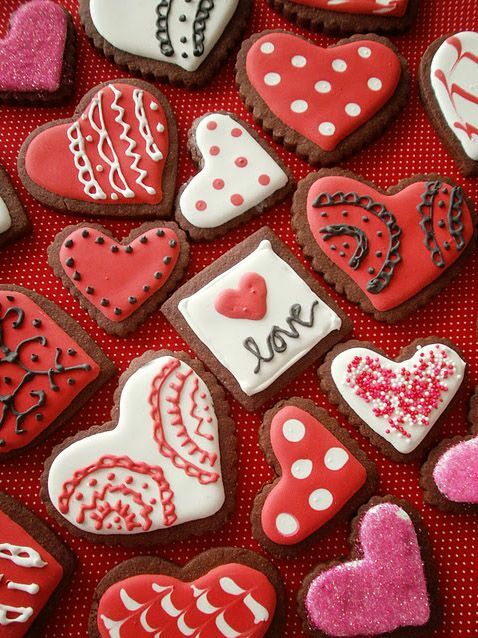 With Valentine’s Day just around the corner, this cookie and frosting recipe is perfect! Now all I need to get are some heart shaped cutters and red frosting gel to make Valentine cookies for G–Man to give at his Patch Club Valentine’s Day party. I hope you all have enjoyed this little post and try out these recipes. Hopefully they will become your go–to recipes as they have become ours! Have a blessed day!!! Afternoon everyone! A couple of weeks ago I asked everyone on Facebook and Instagram what their favorite pumpkin recipe was. Sadly, only one person responded BUT her response was the best one I think I’ve ever made! 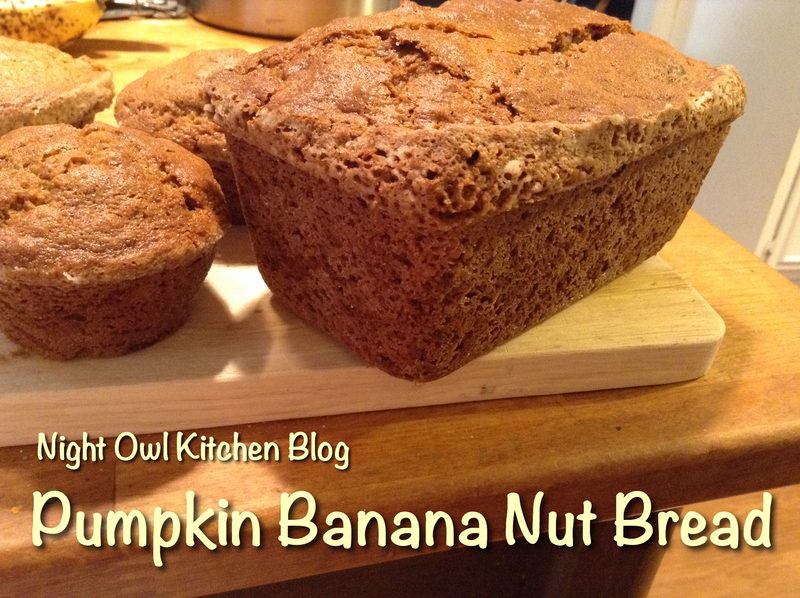 On Instagram a dear friend Melissa suggested a pumpkin banana nut bread. I asked her if she had a specific recipe for it or if I should just fly by the seat of my pants…and fly away I did! I looked around for a 5 star recipe, and sure enough I scored a delicious, delectable, and delightful quick bread recipes from the test kitchen of Nestle. It’s moist and it’s received raved reviews from those who purchased the mini loaves and muffins from me. Everyone loves the combination of the pumpkin and banana, and quite honestly I never would have thought to have put the two together! I can’t thank Melissa enough for suggesting it!! PREHEAT oven to 350º F. Grease and flour two 9 x 5-inch loaf pans. COMBINE flour, baking powder, cinnamon, ginger, baking soda and salt in medium bowl. 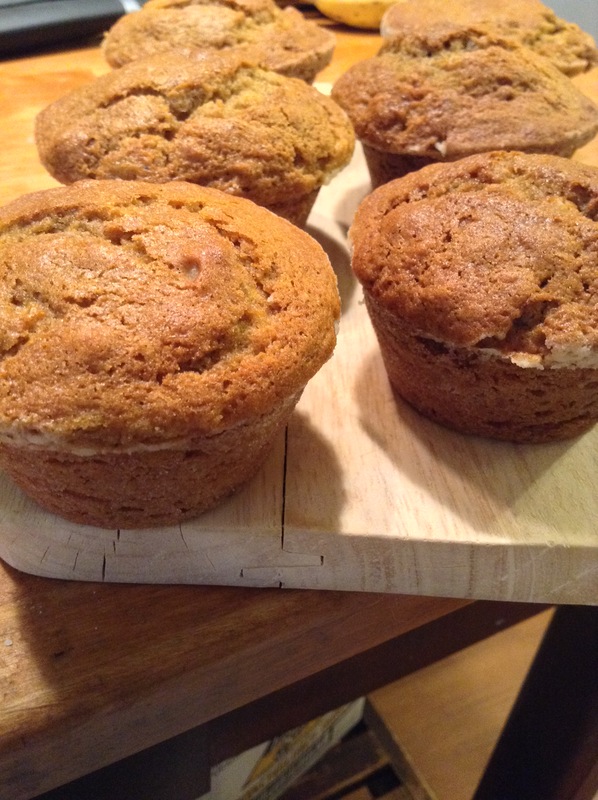 Combine pumpkin, eggs, granulated sugar, brown sugar, bananas and vegetable oil in large mixer bowl; beat until smooth. Gradually beat in flour mixture; stir in nuts. Spoon into prepared loaf pans. BAKE for 55 to 60 minutes or until wooden pick inserted in center comes out clean. Cool in pans on wire racks for 10 minutes; remove to wire racks to cool completely. There is enough batter to make four mini loaves and 6 muffins(or two large loaves as suggested in the original recipe). I think the muffins turned out perfectly! 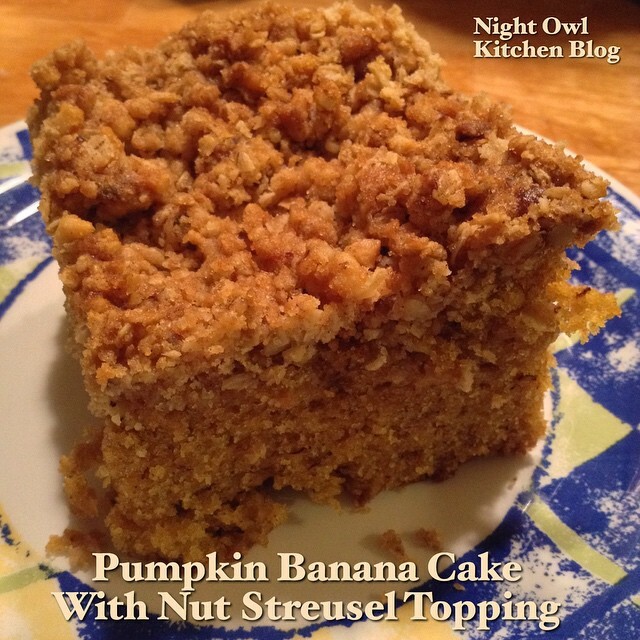 I have enough ingredients that I plan to make more and this time add a streusel topping(per my Mom’s request)! You can certainly use muffin papers if you like, it does make for easier clean up. 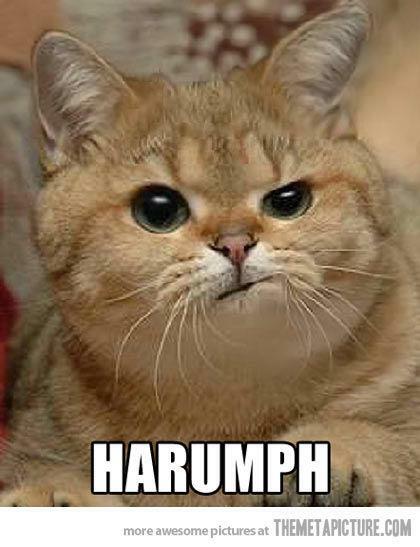 If you do choose to do muffins, don’t bake them any longer than 20 minutes. The mini loaves were done in about 52 minutes or there about. I tested each one with a sharp knife, if it came out clean then it was time to take them out. 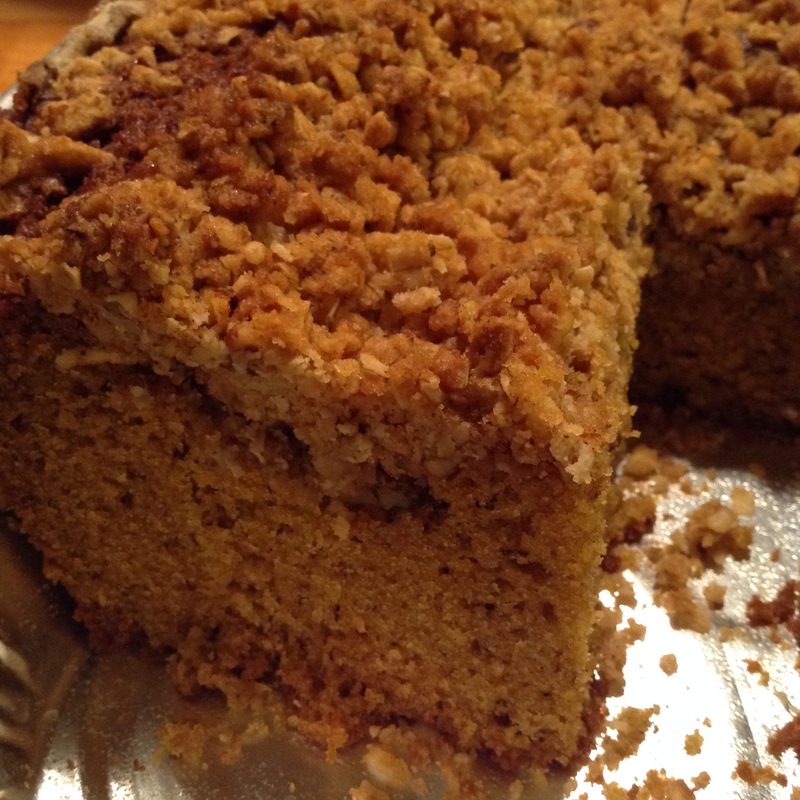 It really is an easy recipe, and with the fresh pumpkin you’ll need to drain it slightly. I just placed the pulp in a mesh strainer over a bowl in the sink and gently moved the pumpkin around to help it drain faster. You’re not going for a dry consistency, you just want it less soupy. AND These freeze up nicely too! If you want to make several batches before the Thanksgiving holiday and give them out as gifts, just be sure to wrap them up in plastic wrap, foil, place in a freezer back(remove all the air), wrap in freezer paper and if you want to make sure to preserve the freshness place them in food saver bags before freezing. Sounds like a crazy way to freeze them but trust me, it works! Just be sure to let them thaw out completely before gifting in a pretty wrap with a bow and tag! I hope you all enjoy this recipe, it has become a family favorite for us! Yesterday I had to use up the remaining bananas, they were oh so ripe! I followed the above recipe to a certain point. With the exception to adding the nuts into the batter. I left those out and put the batter in a greased and floured pan. I went ahead and used one of the large aluminum casserole pans to fit all the batter. So what did I do with the nuts?! Yep, I went there! I added the nuts to a streusel topping 😀 For. The. Win. Mix all ingredients in a small bowl using a fork your fingers. Sprinkle over the cake batter and bake until cake tester comes out clean. Serve warm with whipped cream or ice cream. To freeze or not freeze…that is up to you! A couple of weeks ago I threw together a crock pot pork loin meal that the fam just went to town on it! I honestly wasn’t too sure about it at first because the flavor wasn’t something I hadn’t ever paired with pork before. 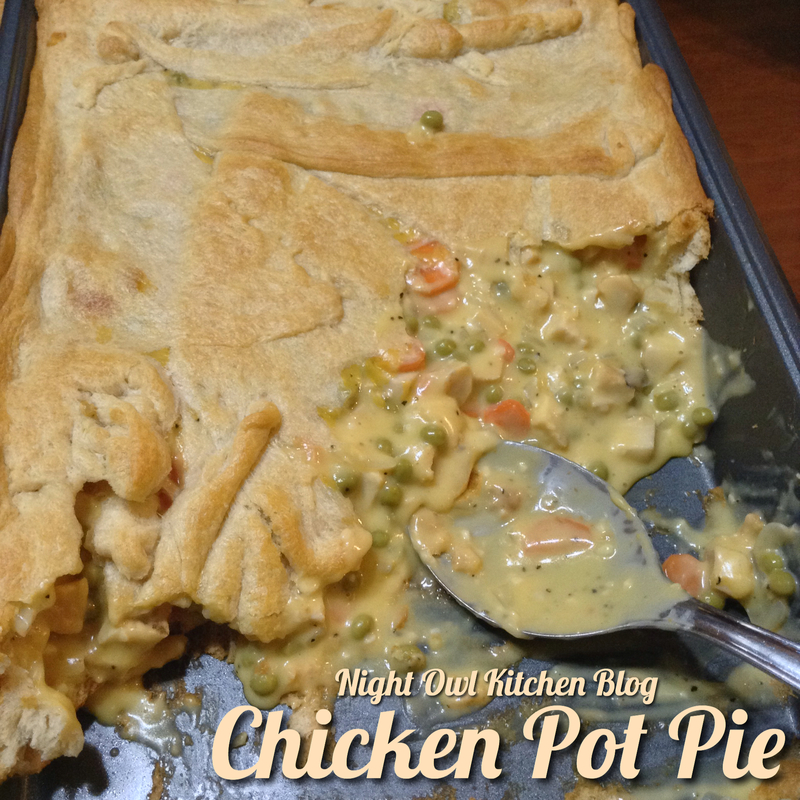 It worked out really well and has proven to be a keeper, tried, true, and oh so yummy! In a large crock pot(I used my 7qt crock) add in water and half a packet of lipton onion soup mix. Sprinkle in chopped onion and place your pork loin on top. Add the mushrooms around the pork loin. Sprinkle the remaining soup mix over the pork loin, cover and cook on low for 8 hours. Just before serving, slice into medallions and spoon the au ju over the meat. Prepare your mashed potatoes, gravy and serve alongside a medallion of pork with a spoon au ju sauce and mushrooms. Properly label a quart size bag with the name of the contents. Don’t forget the date you are putting it in to freeze. I usually stick with the month and year. When loading the bag I like to place the meat in first followed by the leftover gravy and mashed potatoes. Flatten out making sure to squeeze out as much air as you can. Freeze for up to three months. Place the frozen meal pack in the microwave and depending on the power of your microwave you can either nuke on high for 1 minute or defrost according to the weight of the package. You’re just wanting to do it long enough to loosen it up from the package. Place in a microwave safe container and finish cooking for 2–3 minutes until completely heated through. Re-season potatoes and gravy if needed. You can certainly reheat this on the stove top if you prefer. I finally broke out the smaller crock pot since my nephew is away. It’s been quite a while since I’ve used that one 🙂 Since Dad and I have been on a salad binge lately I’m trying to figure out how to keep our nightly salads interesting. I remembered I had some previously cooked grass fed cubed steak (from another meal) languishing in the freezer. I pulled that and some grass fed stew meat out to thaw overnight in the fridge knowing ahead of time I was going to put it all in the crock pot the next morning. We’re not cube steak fans around here, but after it cooked all day in the crock pot even the cube steak was tender. So let that stand, you can use a cheaper cut of meat, slow cook it all day, and get a delicious tender meal that really everyone will enjoy! And yes even my pickiest eater gobbled it up! Go ahead and plug in your crock pot and get it warmed up. Add in chopped onions and bell pepper. Since the cubed steak was already cooked, I went ahead and added it to to the pot. For the stew meat, my pieces were actually really big, too big to just pop in your mouth. So be sure to cut down any large pieces, at least in half since it will render down in cooking process. Season each piece with salt, pepper, and a sprinkle of onion powder. Sear in batches in a hot pan with peanut oil on both sides, then add each batch to the pot. After the last stew meat batch, pour the diced tomatoes on top, add about half a can of beef broth and the minced garlic. Cook on low for 8–9 hours. Give the mixture a quick stir to see if you need to thicken up the gravy. If you do, take 2 TBLSP flour and enough of the leftover beef broth and make a quick roux. Pour over mixture and stir in. It’ll tighten up quickly so don’t use too much! Serve over rice, potatoes, or buttery noodles. Bring it all to a boil and add 3 cups of 5 minute rice. Stir it in, remove from heat and cover with a lid. Do not mess with it. Just set your timer for 5 minutes and let the rice absorb all that liquid. Fluff with a fork and it’s ready to serve! It really is THAT simple! Now, you can serve this with your favorite side veggie, ours tends to be green beans. You can skip the rice all together and just eat the beef tips over a salad as my Dad did. 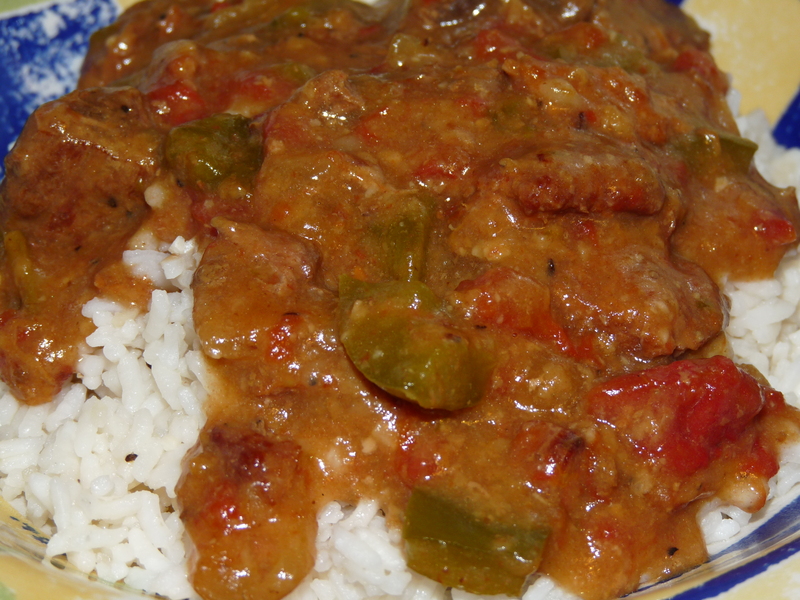 It’s a very versatile, quick, and easy meal! Minimal dishes which is so nice for a change 🙂 Hope you all enjoy and have a very blessed day! It’s important to keep the lid on your crock pot while it’s warming so as to keep the heat inside the crock pot. Each time you add something else to it be sure to place the lid back on. If you have leftover beef broth and you don’t want to pour it down the sink, grab a clean ice cube tray, doling out the beef broth to each section and freeze. 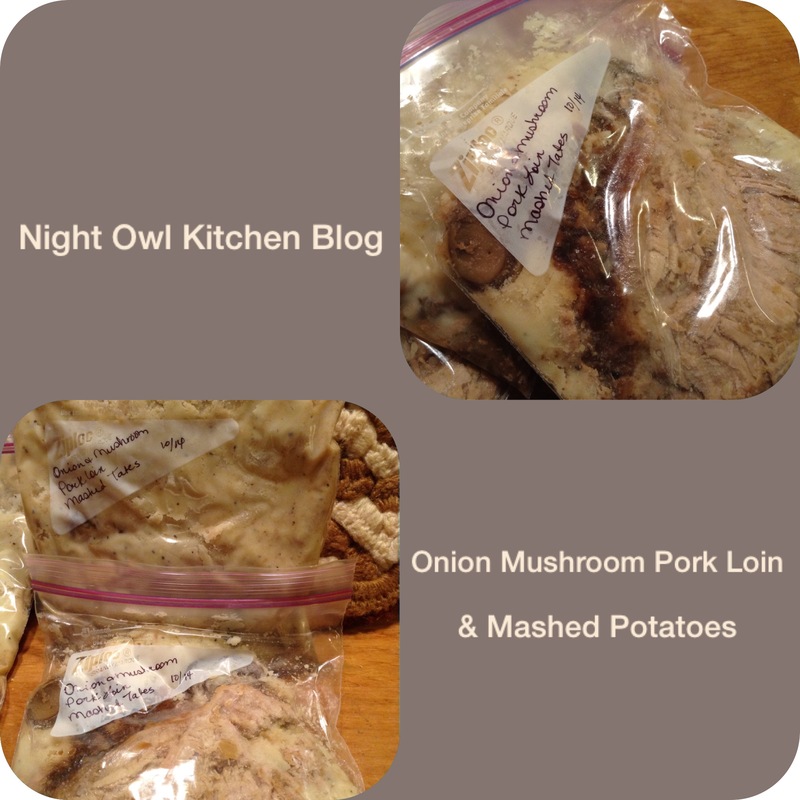 Pop them out once frozen and store in a freezer safe container or bag. They come in handy when you want to add a beef flavor to noodles, rice, and soups. 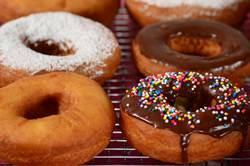 Whether you were aware of it or not, the first Friday is National Doughnut Day! 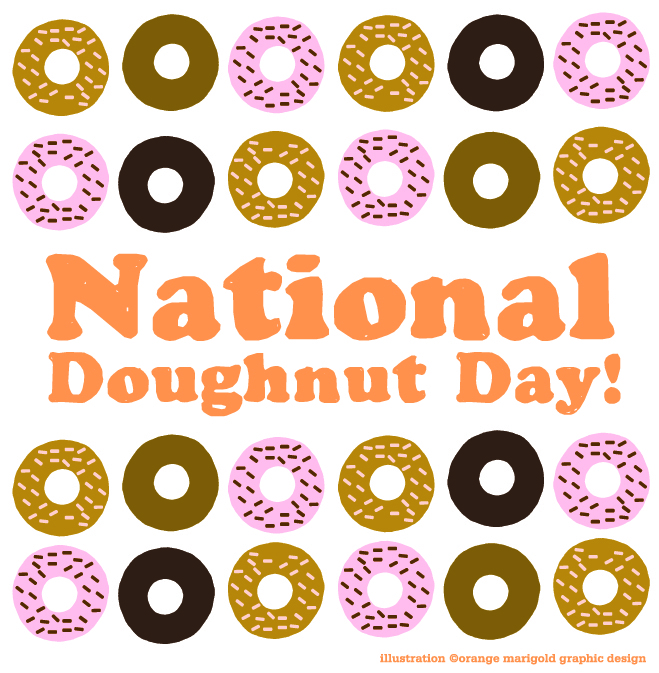 Indeed, it’s a day to celebrate that cakey/yeasty confection with delicious glazes, frostings, sprinkles, or sugary coatings. This was such an amazing read this week. I’m sure we all can name at least one person who has lost their battle to pancreatic cancer. My friend’s Dad died of it, so you can imagine how I felt when I saw this article via Alternative Health Solutions on FB. 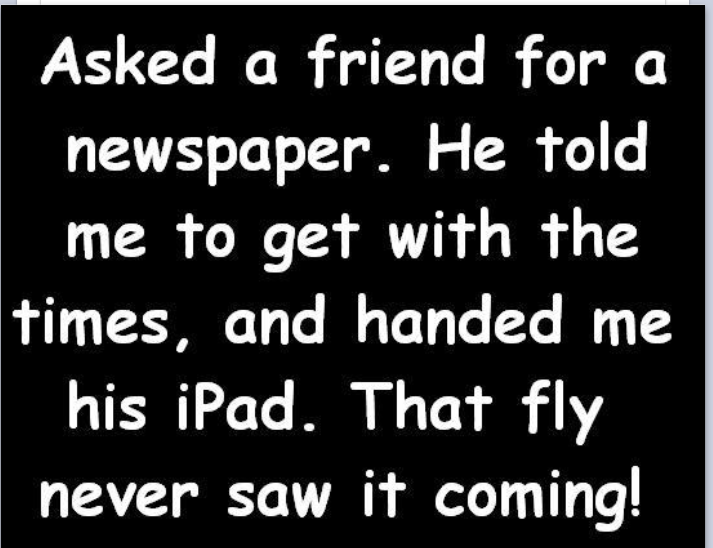 Instantly I shared it and checked it out. I’m all for alternative measures to that of traditional cancer treatment. After losing both my grandmother’s to cancers(one received traditional therapy and the other died too soon to be treated) I’ve made it my personal mission to seek other more natural and holistic measures of preventative treatment. This one is definitely one to keep on hand! 4) You put what into the coffee pot?! If you’re a fan of jalapeno poppers then this is the dish for you! There’s nothing else I can say except…AMAZING! !